Good news, red velvet lovers! Now you can enjoy the taste of your favorite cake in hot chocolate form. 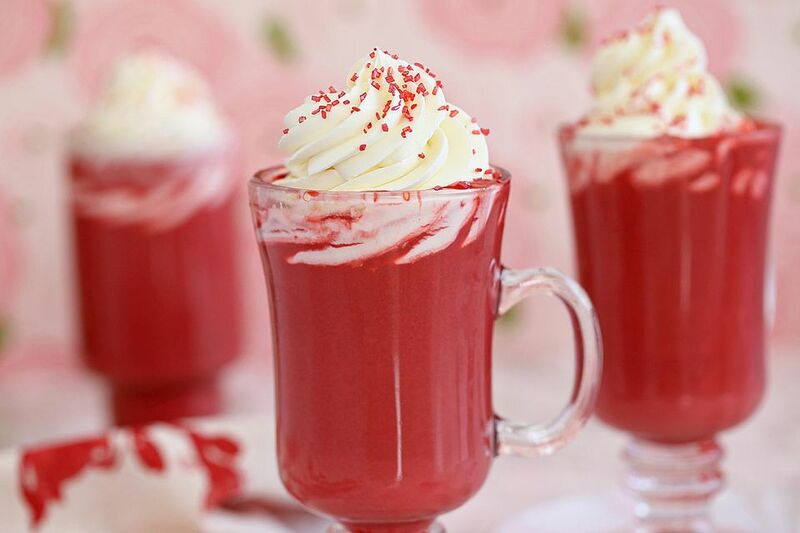 This rich, creamy red velvet hot chocolate drink has all the flavors of the classic cake, including a cream cheese whipped cream topping that tastes just like the frosting. The recipe calls for cream cheese in the hot cocoa base. This is optional and it does add an extra step, so feel free to skip it if you’re in a rush. However, it adds a nice subtle tang that real red velvet cake gets from buttermilk. It also makes the hot chocolate even thicker and richer. Note: while there are multiple steps to this recipe, this drink is broken down into workable categories to help you better plan for preparation and cooking. Add the remaining hot chocolate ingredients, except for the food coloring, and combine everything in a medium saucepan over medium heat. Warm up the drink, whisking occasionally, until the white chocolate melts, the cocoa powder blends into the liquid, and the drink is creamy and smooth. Add a few drops of red food coloring and whisk them in. Continue to add coloring until you get a deep, rich red that you like. Combine the cream cheese, sugar, and vanilla extract in the bowl of a stand mixer fitted with a whisk attachment (a hand mixer with a whisk attachment can also be used). Whip the cream cheese on medium speed until it is smooth and free of lumps. With the mixer running, slowly stream in the cream and continue to whip until the cream cheese forms firm peaks. The cream cheese stabilizes and thickens the whipped cream, so it’s great for scooping and piping on your hot chocolate. Add a scoop to your hot chocolate mug and top with a few red sprinkles, if desired. Use gel food coloring as opposed to liquid food coloring (Wilton’s and Americolor are two recommended brands.) You’ll get a strong red color without using as much food coloring as liquid would require.